Little known fact: Jen loves cod. Given this fact I bought some cod tonight to make for dinner. That must be because I love Jen! 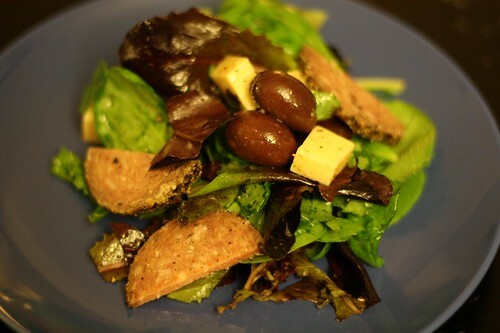 One of Jen's general hatreds in life is a salad that has what she deems to be a "lunchmeat" on it. That being said I thought that if I took this nice uncured, pepper-crusted salami and sliced it up with some Parrano cheese and kalamata olives I could get away with it. I put all of this together with baby spinach, mixed baby greens, olive oil, lemon juice, salt, and pepper. I enjoyed the salad and even Jen had to admit that the lunchmeatness of it was not overly offensive. For the main course I did something that I was sure I'd one on the blog before. Searching I couldn't find any record of having done this on the blog so I made it tonight. I made a simple potato crust with grated potato, onion, scallion, cider vinegar, egg, flour, salt, and pepper. After squeezing out any excess moisture and forming it I topped some fresh cod loin with the potato mixture and seared it in a blazing hot pan with a little olive oil. After getting some nice color I removed it from the pan and threw in some halved brussel sprouts, shallots, and bacon which I browned before finishing in the oven with the topped portions of cod loin. In a small pan I pushed some tomatoes through a strainer and reduced their juice on the stove top. 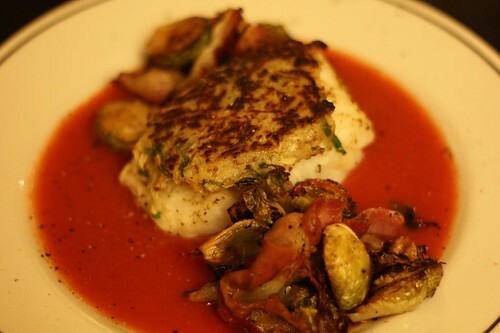 I served the roasted, potato-crusted cod loin chunks on top of the tomato reduction with the roasted brussel sprouts, shallots, and bacon. 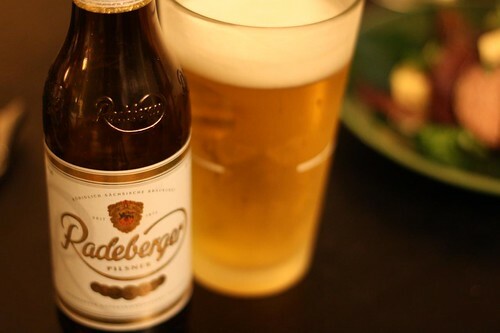 For beer I had a Radeberger which, if the website wasn't the worst website on the face of the Earth, I would have more information to offer on it. After taking the time to enter my birthday (January 1, 1901) and selecting my appropriate country (Albania) I was greeting with a blank page. After then taking the time to actually enter the correct information I was again greeted by nothing. I don't think this is Germany's finest beer. It is certainly not Germany's finest website.